Studies show that 58% of Americans feel that people with nice smiles are more likely to be successful than those without one. This data point proves how important your smile is not only to you, but everyone else. It’s understandable, then, for you to feel uncomfortable about the flaws in your teeth. That’s why it’s important for you to know about the amazing benefits of Invisalign of Wall Township and how it can deliver the results you desire without the hassle of traditional braces. Learn more about this process and how you can take advantage of it. Invisalign is an amazing way to perfect your misaligned, gapped or crowded teeth using clear, BPA-free plastic clear trays. They are custom made to fit your teeth and comfortably adjust them until they reach the desired position. The trays are to be worn for two weeks and then switched to the next set in the sequence. You will continue like this until the end of the process. Convenience – Invisalign aligners are very convenient in that once you receive your complete set of trays from your dentist, you don’t have to go back for adjustments. Conversely, with traditional braces you will need to visit your dentist every 4-6 weeks for them to be tightened. Appearance – You don’t want the whole world to know that you are correcting your smile, so the bulky metal brackets and wires of traditional braces are definitely not preferable. 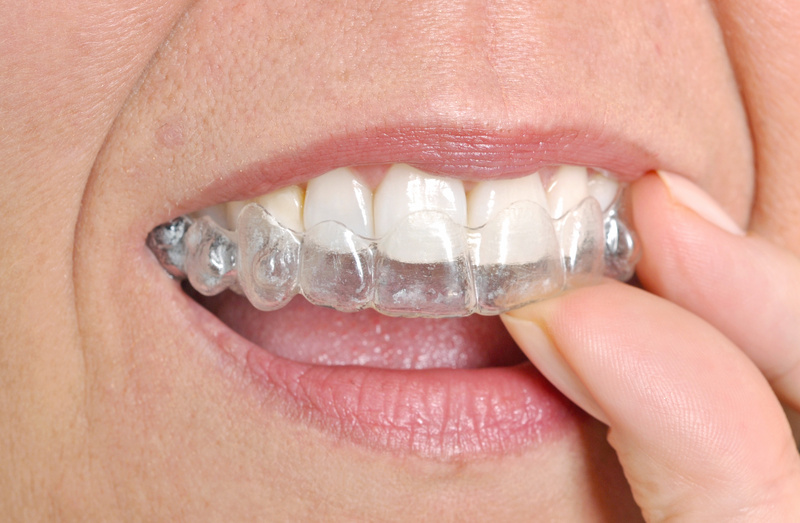 With Invisalign aligners, though, these elements are eliminated, and the trays are clear. This is especially attractive to teenagers who tend to experience a lot of pressure about their appearance. Maintenance of Oral Hygiene – This category is the utmost importance because it affects your oral health. Since your Invisalign trays are removable, you are able to clean your teeth and gums thoroughly, including brushing and flossing them as you normally would. This protects them from the harmful effects of bacteria and plaque buildup that can lead to gum disease. Lifestyle Maintenance – With braces, you are limited to eat certain foods so that you don’t break the brackets on your teeth. Since you have to remove your Invisalign trays to eat or drink liquids other than water, that problem is nullified, and you are able to eat and drink what you normally would. You now have a way to attain the beautiful smile that you’ve been wanting for so long now. And you no longer have to be hesitant for fear of all the undesirable sacrifices that you once thought were necessary to get it. With Invisalign of Spring Lake, the perfect smile is no longer a dream. It’s a reality. Edward J, Dooley, DMD, FICOI earned his undergraduate degree from the College of the Holy Cross and went on to receive his Doctor of Dental Medicine from the University of Pennsylvania’s School of Dental Medicine. Since then, he has remained committed to providing his patients with the absolute best care. He practices at Dooley Dental and can be reached for more information through his website.